UPDATE 11/14/13: We’ve added some new screenshots to show you what the new cover photo layout looks like. 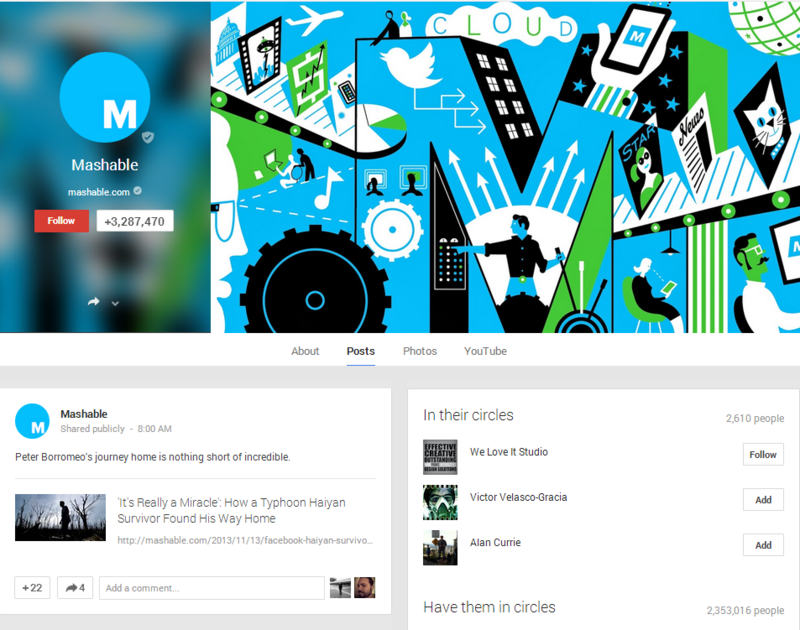 The consensus around the web is that the new Google+ cover photo size is massive. The new size is 2120 x 1192 pixels — which gives businesses and brands a lot more space to work with compared to the old version. How exactly should one design in such a way to control the viewer’s/visitor’s experience? Is there a new template to use? This is a great question, and one that I’m sure many of us are paying attention to. A cover photo can say a lot about a person. What do you want your first impression to be? Since the cover photo takes up about 95% of the viewable screen area, this is your opportunity as a biz owner to make an impact and engage potential customers, clients, and visitors. Think about your goals and your audience on Google Plus. Are you trying to build a community or brand awareness? If so, you may not want to lead with a pushy marketing message, but instead try something more personal that your audience can relate to. Show off people using/wearing your products. Share a picture of you and your team. 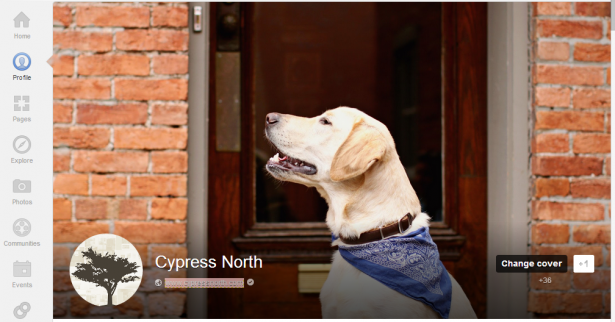 We updated our cover photo with our very handsome, furry friend, office mascot Rogan. People who have read our website and follow us on Instagram, Twitter or Facebook know Rogan — they’ve seen him fetch a beer, dress up for Halloween, and take lots of naps in the office. Find something that tells visitors a story or gives a little insight about you/your brand/your company. It’ll give you some common ground and serve as a talking point when they contact/hire you! Here are some of my initial thoughts and observations about the new Google+ cover photo, plus a new template and size specifications to help you update yours. If anyone was worried about screen resolution size and how that plays into the massive cover photo, worry no more. The cover photos dynamically resize proportionately using 16×9 ratio to fit your screen resolution so you – or a visitor – will always see the cover photo, a preview of a person’s first post, circles, and navigational elements no matter what browser or resolution. A bigger photo size means that you now need higher resolution images to make your page look visually appealing to visitors. Avoid using blurry or pixelated images. 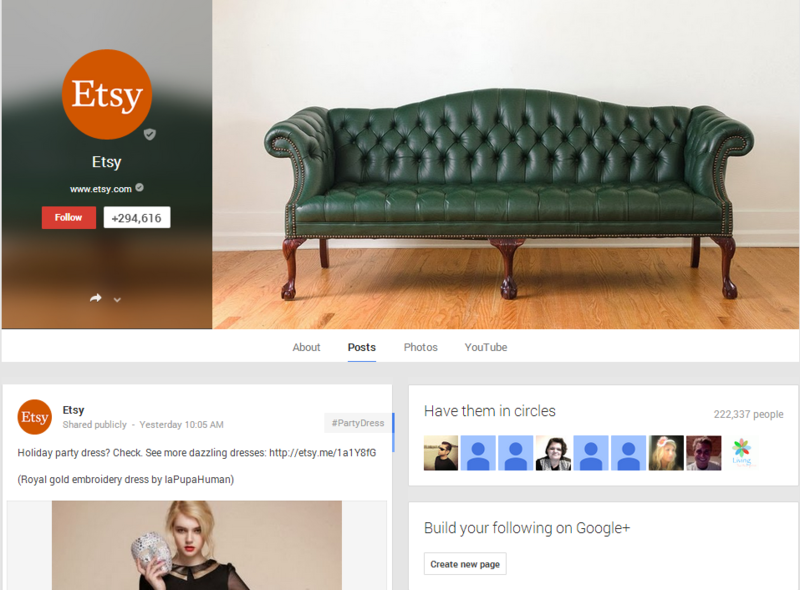 Here’s a look at some creative uses of the new Google+ cover size. 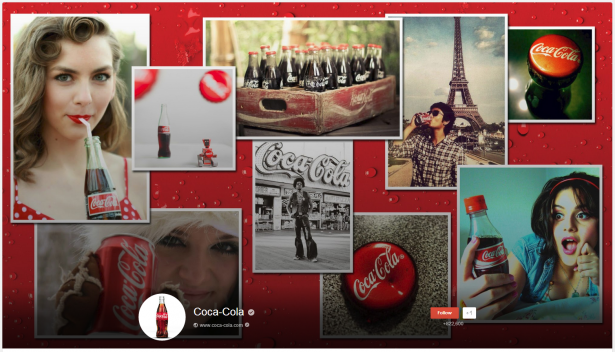 Coca-Cola uses the cover photo as a collage to display photos of the ice cold pop around the world. 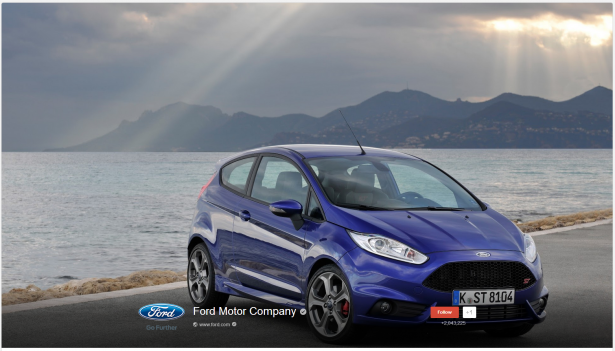 Ford uses the cover photo to display a beautiful image of one of their vehicles. The logo has a transparent background, which makes it look like part of the cover image. 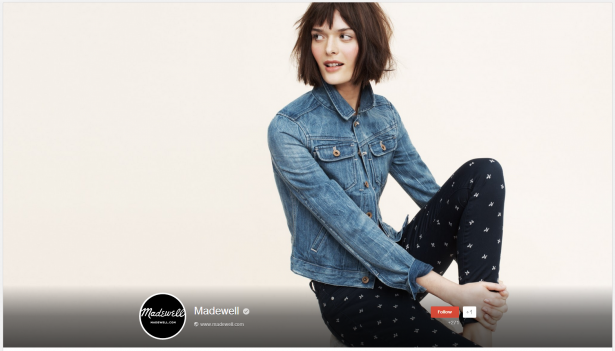 Madewell goes simple — which is very much in line with the brand aesthetic — and displays a very clean image of a model wearing pieces from the company’s line. 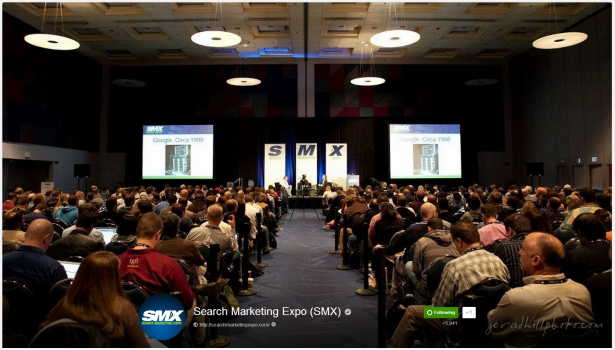 SMX chose an image from a session at a marketing conference to give visitors a glimpse into what it’s like to attend the industry show. 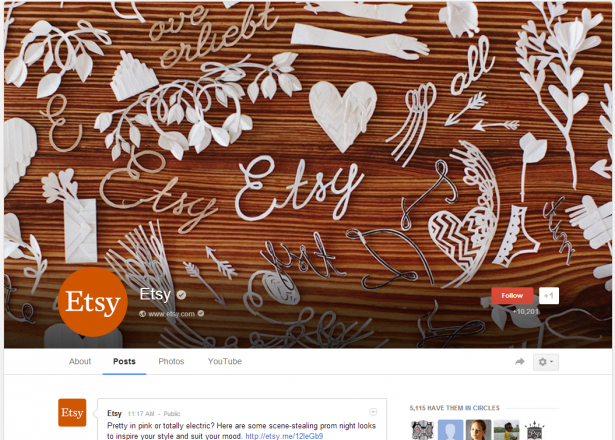 Etsy does a nice job showing off handmade items and letters. This is also a great example of fitting the logo to the circle and square format. Try bringing attention to your Follow and +1 buttons to encourage users to connect with you like they used to do on the Facebook fan gate pages; I haven’t seen an example of this just yet, so let us know in the comments if you find one! Since the cover photos re-size to fit your web browser, it’s a bit harder to create a template download as the profile image and page details move depending on the resolution of your web browser. As you can see, the page details get smaller and move more towards the center when viewing the page at full screen vs. a larger logo and details that better fill the page when viewed at a smaller size browser. 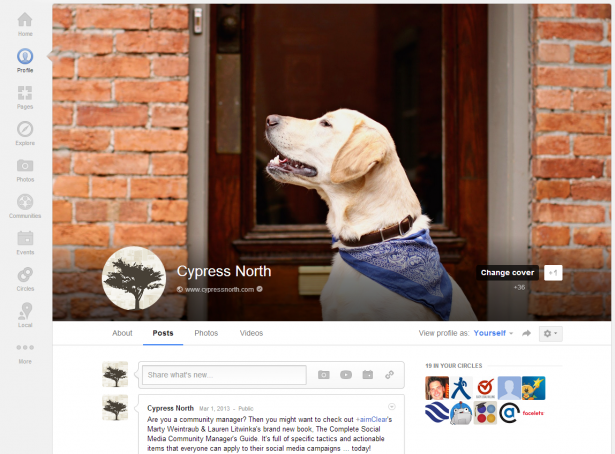 UPDATE 11/14/13: Google has once again changed the layout of the cover photo for Google+. 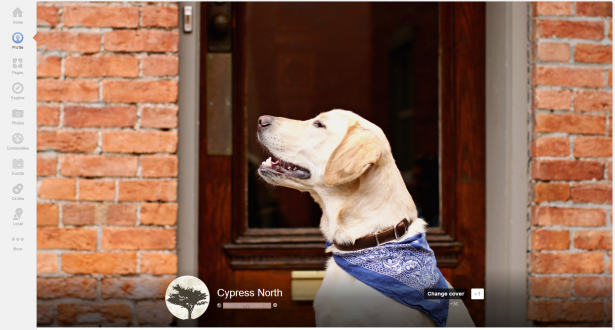 The newest version displays your full cover photo on the page, taking up about 2/3 of the width of the page, with the remaining 1/3 displaying the page/user information, a button to quickly circle the page/user, and an option to share the page/profile. The background behind the information section is a re-purposed version of your cover photo with a blurred effect applied. Cover photo dimensions remains the same: 2120 px by 1192 px, aspect ratio 16×9. 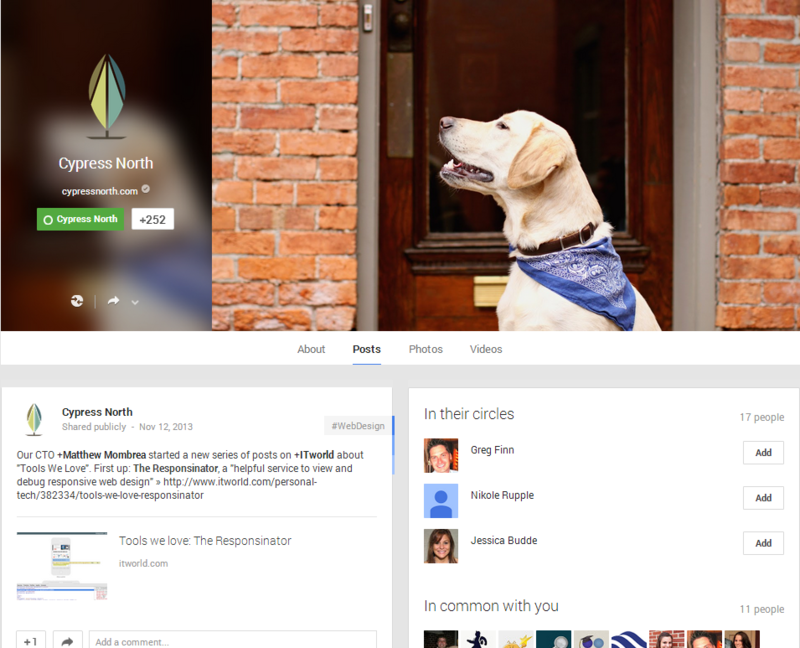 The change is live for all users, and you can still use our free downloadable template to create a compelling, engaging cover photo for your Google+ profile or page. I think this is a nice upgrade from the previous, massive cover photo. To get you started, here is a free Google Plus Cover Photo .PSD template already sized to 2120 x 1192. It might take some trial and error; however, the good news is that there isn’t anything blocking the top part of the photo. We’d love to see what you create — stop by and leave us a link to your profile so we can check it out. Good luck! For more posts like this one, be sure to follow Cypress North on Twitter, Facebook, and Google+. Hi Trish! I’m glad to hear you’re going to give the new cover photo a shot. You’re absolutely right — embrace the new size and use it to your advantage. I’d love to see what you create. Stop by and leave a link so I can check it out when you’re done. Particularly impressed with Ford’s effort, out of interest how do you think they have removed the shading bar to leave such a crisp transparency on the image. Hi Matt, are you talking about the black gradient? It looks like it is still there to me — the bottom of the image is a little darker than the rest of it. It just might blend in a little better since the bottom of the photo is black pavement. If we add rulers to the PSD template, any idea where the specific cross points on the ruler are that would be where the +1 page box falls into in order to know where to point any “stand outs” to? I updated the PSD template with rules and a guide layer that indicates the approximate locations of where the +1 button is, page name and logo area. Thanks for the idea! I have a rectangular company logo and had a difficult time fitting into the square profile photo space, now the circle makes it look even more odd. Is there a way to not have the profile photo at all? The other thought I had was to create a new graphic cover photo with our logo and find a appropriate related photo for the cover photo. I updated my cover photo to the new size, but when I view my page as ‘Public’ it has cropped off the top half of the image. It will appear if you scroll the page but the full image does not appear unless you do this. Very fustrating! How do I know how much of the image will be seen? Cover photo looks great, Jamie! Very creative. Thanks for sharing. I hate this sell, sell, sell thing happening now in every possible social site. I am here doing research for the company I work, but I have to say, from a personal point of view, how annoyed and frustrated I am to see brands everywhere. Tiffany, thanks for sharing this. I am working on the cover image of my page right now and i will try to make use of your notes. Having an issue getting the image to look clear on the page. It keeps looking faded or stretched event though my image is the native resolution. What settings do you use and what file format should I be saving too, in order to get the best quality? Google does a great job of supporting high res images, so I don’t do anything different when saving for my cover photo size. 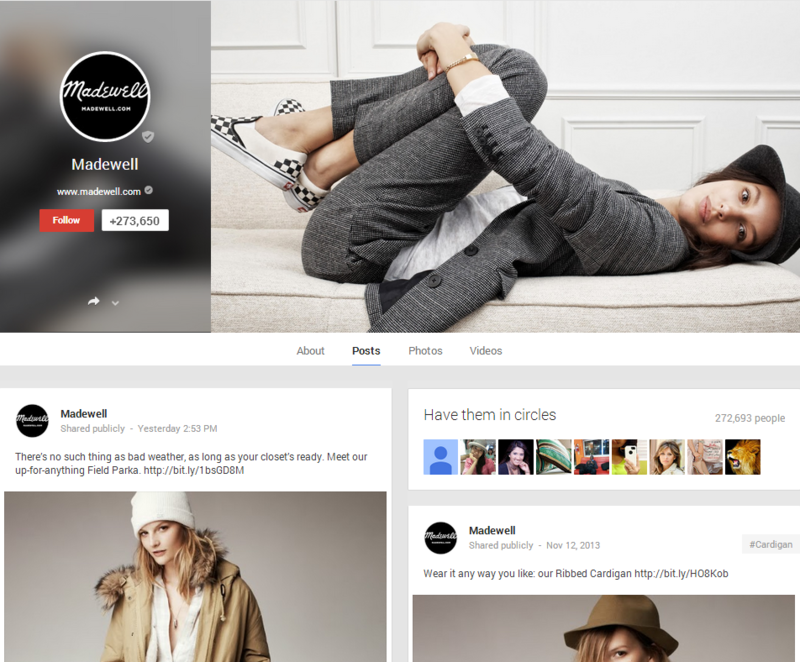 Do you have a link to your Google+ page so we can take a look? Maybe other community members can chime in to help. I saved mine in PNG format 2120 x 1192. Make sure you actually did save it in that exact size. But PNG helps because it accepts scaling better than the lossier JPEG format. Remember JPEG is compressed a lot. I uploaded a transparent image for use as the Avatar like ford did but it seems Google has changed something as it automatically received a black background. 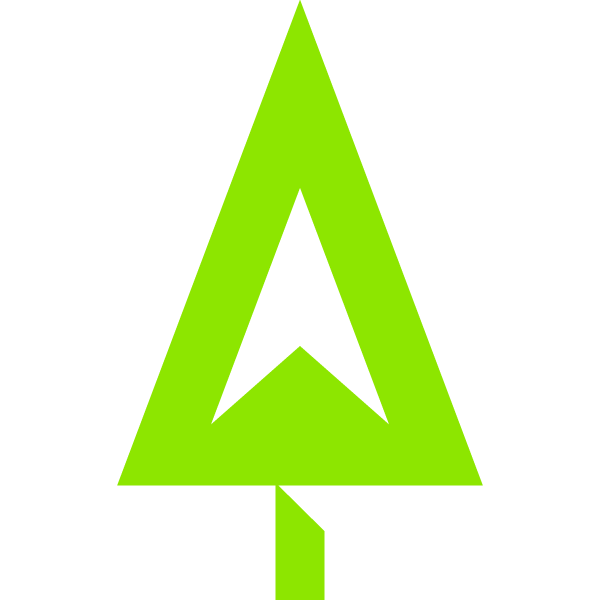 Not sure if you still experiencing the background showing up on your transparent avatar image, but just wanted to let you know I have been able to successfully use a transparent .png image on Google+ without a background showing. Not sure what image format you were using but just thought I’d let you know that transparent .png appears to be working ok. The cover photo looks a little better to me today. Maybe it just took a while to load or I was just staring at it too much yesterday when I was making it. Anyway I did use native res and a .png file but even looking at a page like Adobe’s there cover photo didn’t look as high res as I would expect. Let me know what you think and thanks for the help it’s for my company’s page but we don’t really use it yet. It’s just linked to our youtube page so I put it together really quick. Thanks so much for the info! I kept trying to get the dimensions right…but kept failing! LOL! Thank you Tiffany, I do go with great ideas and a FREE PSD template to start working on it. I will make sure to came back and share my G+ cover photo. I need to update mine – you gave me some creative ideas, Tiffany. Thanks very much for your article and template, they were a great help while redesigning our new Global Trading Tools cover image. thanks for the help. Really helpful while creating my cover photo on google plus. If I create an image that is NOT the full height (i.e. : 2120 x 300 pixels) is Google+ going to simply add black space, stretch the image vertically, or only display that size, thereby getting rid of that annoying “pop” that happens when the page redraws? Tiffany, I want to thank you so much for this posting! It really helped me out tremendously, Your assistance is appreciated a lot more than you can imagine! thank you so much for the info and template! I loved the ‘inspiration’ samples. And thanks for the psd template, it’ll save me lots of time! I did not think I would be perplexed with what my original Cover Photo image size should be, to begin with. Every time I re-size in my graphic program & up load to Google+, I am asked to crop which the image becomes distorted. I’ve changed my cover image to perfect size to fit whole layout, thank you for sharing this awesome tips. Tiffany, thanks for this overview. I have a question though that I don’t see mentioned. Whenever I bring in my image I get a cropping tool and it only takes the “crop” and blows it up to be my page. Whats happening here? Doesn’t make sense to me. Shouldn’t I just be able to import an image and thats that? Just “crop” your entire image. Drag the tool to the top left corner and drag to bottom right to get the full image uploaded. Hope this helps! Is there any way to change the background around the profile pic instead of google just taking a part of the header image and blurring it? You can add your website link in the About tab under “Links”.